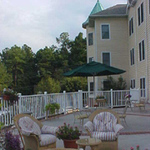 Sunrise of Raleigh, located at 4801 Edwards Mill Road, Raleigh, NC 27612, is a senior living community specializing in Alzheimer's, Assisted Living. The community is a part of Sunrise Senior Living's family of senior care communities. The cost of living in Sunrise of Raleigh starts at about $3,011 a month. Just minutes from Crabtree Valley Mall, Sunrise of Raleigh is Raleigh's "castle on the hill." 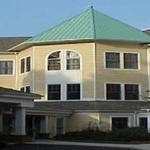 We pride ourselves in our individualized care, home-like setting and long-term staff members. View the complete list of or for all Sunrise Senior Living Raleigh facilities Raleigh assisted living communities. For more info on Sunrise of Raleigh, contact the community with the form to the right. Sunrise of Raleigh is located at 4801 Edwards Mill Road, Raleigh, NC 27612.